THE B-MOVIE NEWS VAULT: STOCK YOUR VAULT: New DVDs & Blu-rays for 06/05/2018! STOCK YOUR VAULT: New DVDs & Blu-rays for 06/05/2018! On the cusp of the Vault's 18th year on the web, I give unto you my beloved Vault Dwellers a new edition of Stock Your Vault! This week has a good mix of Hollywood releases, independent horror flicks, anime, and a few cult oddities! 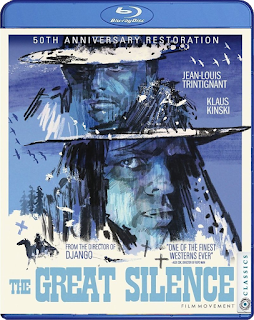 Scream Factory brings IFC Midnight's DEVIL'S GATE and THE MIDNIGHT MAN to Blu-ray, Cult Epics gives FRANK & EVA its HD debut, Doppelganger Releasing brings Robert Downey Sr.'s GREASER'S PALACE to Blu-ray, and Film Movement Classics gives Sergio Corbucci's THE GREAT SILENCE a new 2K transfer for its 50th Anniversary Blu-ray release! For 4K fans you can pick up ESCAPE PLAN (which has a sequel coming at the end of the month), THE INCREDIBLES (ditto), and season one of GAME OF THRONES, while you anime lovers can treat yourselves to MOBILE SUIT GUNDAM AGE: COLLECTION 2, SATELLITE GIRL AND MILK COW, or BLACK BUTLER: BOOK OF THE ATLANTIC! There's truly something for everyone, so be sure to scroll down to see the full list of this week's new DVD and Blu-ray titles! Contains: Superman/Shazam! : The Return of Black Adam, Superman: Doomsday, All-Star Superman, Superman/Batman: Public Enemies, Superman vs. The Elite , Superman/Batman: Apocalypse, Superman: Unbound, and Justice League vs Teen Titans! Contains: Kurozuka: The Complete Series, Ultraviolet Code 044: The Complete Series, and Viper's Creed: The Complete Series. Contains: Miami Vice - Season One and Knight Rider - Season One. Contains: Merlin, Merlin's Apprentice, and Merlin: The Return.